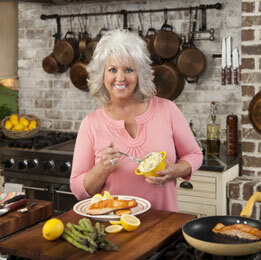 No one is immune to the big, bright personality of the Food Network’s most loveable host, Paula Deen. The self-made woman got her start in the early ’90s, running a catering company out of her Savannah, Ga., home with the help of her two sons, Jamie and Bobby. What started as a way to make ends meet blossomed into two restaurants, an Emmy-award winning cooking show, an eponymous magazine and a line of 14 cookbooks, cookwares, spices, baked goods, dishes, furniture, greeting cards and more. We talked with the culinary icon ahead of her Dec. 8 appearance at the Tropicana in Atlantic City to learn a little more about America’s favorite Southern chef, her family, and her holiday plans. 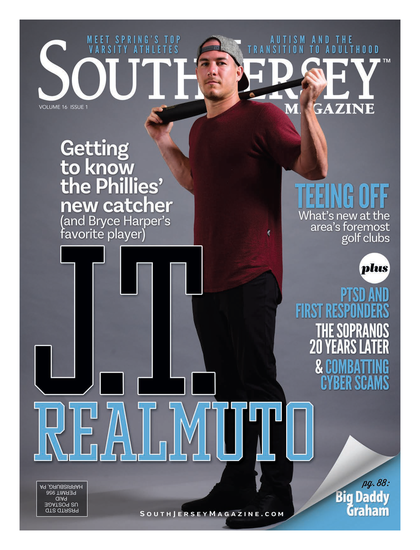 SOUTH JERSEY MAGAZINE: You’ve gone from an at-home cook to a business mogul. How do you think that has shaped your career and your fan base? PAULA DEEN: I’ll never forget where I came from. I think one of the reasons why I related to the women and home cooks in America is because I’m one of them. I know what it’s like to feed a family and to fight hard for what you believe in. SJM: What are the values you still try to instill through your show, cookbooks, appearances, etc.? PD: Honey, if I can do it, anyone can. That’s been my main message all of these years. If you have a dream, you have to pursue it and love that dream so much. You just have to believe in yourself and take a few risks along the way. SJM: What is the first thing you remember learning to cook? PD: Chicken and dumplings. It was a staple back in those days, and still is here in the South. I remember making it for my daddy. SJM: As a Southern cook, what are some of the biggest differences you see in your recipes and that of other areas of the U.S.? PD: Southerners believe in their vegetables. We have veggies at just about every meal. That’s something that I say with a lot of pride. I’ve been all over the U.S. and I have to say that the South takes their vegetables more seriously than a lot of other places. SJM: How did your sons join in the mix to become celebrity chefs themselves? PD: You know, I guess it was a natural progression for them. They’ve always worked in the restaurant with me. When I was lucky enough to land my first show, they came on set for some of the episodes. It just felt like a natural fit for them to have their own shows on television. SJM: Your younger son, Bobby, went on to create his own show, Not My Mama’s Meals, promoting healthy cooking and eating. Is this something you are beginning to work with as well in your appearances? PD: I’ve always preached moderation. The way that I eat on my show, and those recipes that I make—it’s not what I eat day to day. That said, I am trying to make daily changes in my life to live a healthier outlook. I love seeing Bobby lighten up some of my recipes. I’ve incorporated fresh salads from the garden into my daily diet, and I’ve been walking at least 30 minutes every day. SJM: How do you maintain your big and bright personality that every­one has come to love during long trips and tough work hours? PD: I feel like I’m really blessed to have the life that I have. I have way more to laugh at and smile about than I do to be upset over. Those are the thoughts that give me the energy to make it through long days. SJM: What are some of your favorite dishes to make when you’re not on the road or in front of a camera? PD: [My husband] Michael has always loved my oxtails and rice. It’s a real Southern treat. I also just planted my fall garden, and I’m obsessed with Brussels sprouts this season! SJM: Are there any dishes that your family still requests at every holiday gathering? PD: It depends on the occasion. For Bobby’s birthday, I always make goulash. Jamie loves to have my coconut cake. For Christmas, my Aunt Peggy and I always make her sweet potato soufflé. SJM: You were one of the stars at last summer’s Atlantic City Food and Wine festival. How does the Jersey Shore’s dining scene compare to others you’ve experienced? PD: I think the Jersey Shore loves seafood just as much as we do in Savannah! SJM: Is there an overriding message you’ll try to convey to the audience at the upcoming event in A.C.? PD: It’s not all just about the cooking. Life is about love, family, and the relationships you create. And of course, we’ll have some laughs along the way! SJM: Do you have any quick tips for readers on throwing a successful holiday party? PD: I know it’s tempting, but don’t try a new recipe when you’re throwing a party. Stick to the tried and true ones that you’re used to making. Not only does it throw risk out the window, but it will also relieve a lot of party planning stress. SJM: What are you looking forward to the most this holiday season? PD: I can’t wait to spend this holiday season with my grandbabies!